Even if you’ve never suffered from depression, chances are fairly certain that you have a friend or family member who does (estimates say as many as 1 in 5 adults). And less than half of the people who suffer from depression and related disorders don’t get the help they need (an estimated 41% get treatment). Luckily, for the depressed makers of the world, leveraging our creative abilities is often a way of coping with the illness and successfully combating it’s destructive impact. Long story short, Lee’s book – How to be Happy – is a workbook for creatively dealing with sadness. Of course this is a Creative Heroes post and not a book review, so I’ll simply say this: pick up his book for yourself or a friend. For me, working through How to be Happy felt like I was creating my own map for navigating the corn maze of sadness. Lee’s thoughtful responses to my questions were just as amazing. Read on for inspiration! C+M: One of the things I teach in my Time Management for Creative Peeps class is about 3 enemies of creative productivity: over commitment, disorganization and procrastination. But I know from personal experience that mental/emotional challenges such as depression and anxiety are also a huge productivity obstacle for some creative people. Besides the obvious (seek professional support… and get copies of How to be Happy and The Art of Getting Started!) – do you have any suggestions for someone who is struggling to get to their creative work due to depression? Lee: Those 3 enemies you talk about can often be a side effect of depression too. The times I’ve struggled with depression are the times that my disorganisation and procrastination got worse and worse, and the times that I started committing myself to every opportunity that came my way. Those 3 enemies are a kind of self-sabotage, and depression is the ultimate form of that. It’s really tough when your creative work pays the bills and depression is making it seem impossible. You feel under more and more pressure to just get on with it, and the more pressure you feel the more just getting on with it seems impossible. One thing that can really help is breaking your creative work down into chunks, and I mean really tiny chunks. I still have days (sometimes weeks) when I feel like I genuinely can’t do any work, and I’m lucky enough to be in a position where I can have a day or two without working if I need to. But the way I get back into work again is always by breaking it down. If I can do 30 minutes work in a day that’s better than nothing, and if I can do 30 minutes I will more often than not be able to do another 30 at some point in the day, and then another, and so on. There are so many tips I could give here, but so many of them are things anyone struggling with depression will already know that work. Things like: drink a glass of water, take a shower, clean your work space, go for a walk, call a friend, brush your teeth, the list goes on… It can often feel counter intuitive when your depression is stopping you working to take time away from work. But that’s so often exactly what you need to do. Get away from the pressure for a while and do something for yourself that isn’t work based. It’s really easy to get trapped in a downward spiral of more depression and less work, the only way to get out of that spiral is to physically get away from it. C+M: Is there a typical day or week for you? If so, what does it look like? Lee: I often wish there was a typical day, but generally there isn’t. My days aren’t extraordinarily exciting or anything like that, I still spend most of my days working from home and doing normal things, but there isn’t really a routine that I settle into. At the moment I’m in the early stages of writing my next book, and it’s the part I find the hardest because I’m completely free to do whatever I want. Because the book isn’t a thing yet, it’s just a bunch of ideas. It’s times like this that I really crave routine and rules, if I feel too free I can really begin to procrastinate and doubt myself. So it does help to put some routine in place, at the moment I’m forcing myself to work on the book 4 hours a day, even if I just sit there and think about it. The annoying thing is that as soon as I have too many rules and too much routine I start to really crave freedom. For me it’s about finding a balance between the two — or trying, at least. C+M: Do you have any rituals for starting or ending your day, whether you’re home or traveling? Lee: My only ritual is giving myself adequate time to actually wake up. It takes me a while to wind up in the mornings, so I tend to just sit with a coffee for a while, which is similar to your routine I guess. [I shared with Lee that I start my day with a cup of coffee and a 30-minute meditation.] I don’t “actively” meditate these days, although I used to, but I’ve definitely learned the importance of that hour or so in the morning when I just sit and be. C+M: As a freelancer, author, artist and traveler, do you have a particular way that you manage your schedule? Lee: I’ve tried so many ways to do this, from the most complex apps to the most simple scribbles. I find each method good for a little while until it all falls apart. For a long time lists were the way I managed my time and tasks the best. But I started to get a bit too obsessive about them, and it actually began to hinder my work. I would have a master list, a weekly list, and daily lists — then I started breaking those down into work and non-work tasks. It got to the point that I’d spend more time making lists about doing things than actually doing them. A few months ago I read a post about bullet journaling, and that’s what I’ve been using since. It’s really genuinely changed how I manage my days. One thing I always struggled with when using simple to-do lists was overloading myself with too many tasks each day. But I’m finding the bullet journal method helps me to be much more productive. I’ve been doing it well over 3 months now, and that’s the longest I’ve stuck to any time management method other than to-do lists. You’re the second person to mention the bullet journal to me recently! It sounds like an interesting technique. I was honestly so skeptical about the bullet journal, because I looked at it and it just seemed to be a bound version of regular to-do lists. But it really has helped my productivity quite a lot, I can’t put my finger on why but I’m not worrying about that too much. It’s also really adaptable, I’ve read a lot about “hacks” where people have customised it with their own little systems and stuff. It’s great. C+M: I recently had a discussion with another artist about our ability to make time for the things we WANT to do, no matter how busy we are. (because we often use the excuse “I’m too busy” or “I don’t have time” to stand in our way) Do you have any thoughts or wisdom can share about this idea? Lee: I have this same discussion with friends all the time, and it’s a good thing to constantly think about. No matter how busy you are or think you are, if you want to do something you will make the time to do it. If there’s something you really really want to do and you’re too busy to do it then something is obviously wrong. We’re all so addicted to being busy these days, because it feels like society demands that from us. There’s such pressure to be constantly doing and constantly switched on that we feel overworked from just existing. I used to convince myself I was “too busy” for so many things, but looking back I know that the problem was really that I didn’t want to do them enough. One thing that’s helped me make that realisation is being more intentional with how I use my time. It’s amazing how many things we do each day without actually considering if we want to do them in the first place. Social media is a classic example for me personally. I used to habitually check social media without even really thinking about it. It sounds stupid saying it now, but it just felt like that’s what I was supposed to do. It felt like it was just a part of life, especially as a freelancer. Once I actually thought about it I realised that I didn’t really enjoy constantly looking at social media so often, and I definitely didn’t NEED to even if it felt like I did. I started to ask myself the same questions about pretty much everything I did, and it made me much more aware of how I spend my time — and much more aware of how much time I actually have. I never feel too busy these days, I know that if I want to do something I can do it. C+M: Working artists and creative people who freelance often have to balance non-creative stuff (marketing, invoicing, social media, etc.) with time to actually make stuff. Do you have any suggestions or best practices for people who are trying to deal with that balancing act? Lee: I personally find the non-creative work much easier than the creative work, so I often do things like invoicing and replying to emails in the times I’m struggling with ideas. I think one of the problems is that we make such a definite distinction between non-creative work and creative work. If you’re a freelancer it’s all just work. You’re a complete business wrapped up in one person, so you need to have every department of a business within yourself, and you have to do all of that work whether you like it or not. Using a bullet journal has really helped me there too, because all of the tasks you put into it have the same weight. Replying to emails is exactly the same as writing a book. As soon as you remove that distinction between creative and non-creative it’s much easier to get on with it. If you’re making a living as a freelancer you’re incredibly lucky, and most times it’s a choice you made because you want that life. So you have to accept that being a freelancer isn’t all about making and creating, and if you can’t accept that then you need to ask yourself if life as a freelancer is really what you want. C+M: Do you have any productivity strategies that have been helpful for you during really busy times or times when you have non-inspiring work to accomplish? Lee: This is probably a bit weird, but I find the non-inspiring work really helpful and inspiring. I always used those tasks to procrastinate when I was struggling with the creative side of work. So now they’ve become kind of like my thinking and brainstorming time. If I feel like I’m in some kind of creative rut I’ll tidy my desk, reply to every email in my inbox, or get all my accounts and expenses in order. I always come back to the creative task feeling refreshed and with a few more ideas. But my biggest productivity strategy is to look after yourself and remember that the work is just work, it isn’t you. As soon as you make work the most important thing in life everything else suffers, which eventually leads to the work suffering. You’ll always be most productive when you’re taking care of myself, seeing friends often, eating well, and enjoying your free time. There is so much talk about finding the work/life balance in modern life, but it’s not something that you find, it’s something that you create for yourself. 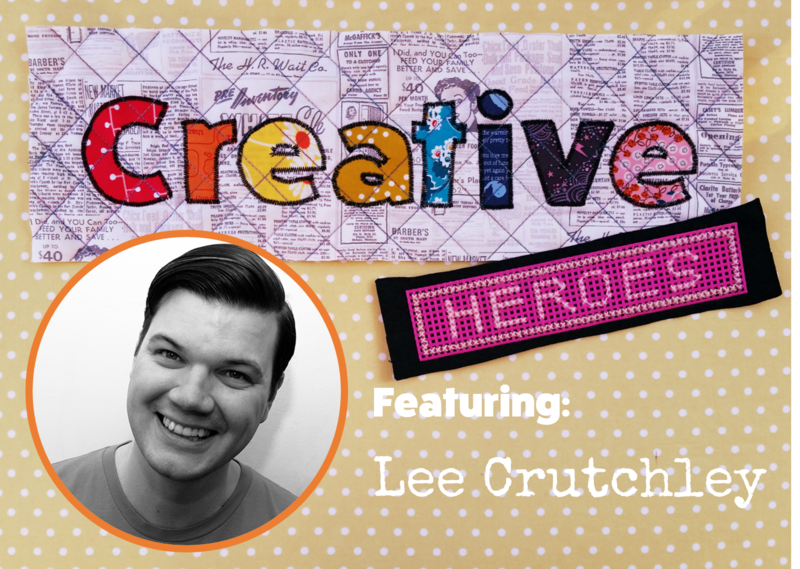 I hope you’ve enjoyed this installment of Creative Heroes! Many, many thanks to Lee for his kindness and thoughtful answers to my questions. Keep your eyes peeled for his next book – he didn’t reveal what it’s about, but he hinted that it will be available in 2017! Want more Lee Crutchley? Check him out on his artist/author website, his Quoteskine website, his Instagram, and sign up for his occasional newsletters (they’re “more like letters and less like news”)! Like this series? Please share it with your fellow creative peeps!